The term carpet trim refers to a wide group of door bars, threshold strips and floor trim. It is a catch-all name of products which join one floor covering to another. Without them you would have at best an unsightly seam, and at worst the edge of your flooring would become frayed, chipped or tatty. Having invested in a stylish, new floorcovering, the last thing you want is to see a tatty join. Sadly, the quality of floor trims installed by fitters as the standard is often cheap and flimsy. We supply a comprehensive selection of quality carpet trims, which you can buy online and have delivered to your door. Either fit yourself or give to your fitter to install for you. 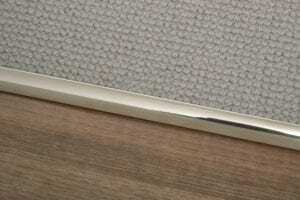 This is an extensive choice of popular door thresholds and matching specialist trims for common problems, such as Ramps to bridge differences in floor levels. Made in brass and supplied in ten metal finishes: polished, satin and antique brass, brushed and polished chrome, pewter, black satin and polished nickel. Popular products in this range include the Double Z9 which joins carpet to carpet and also carpet to hard floors. The range that interior designers adore! An amazing, pristine finish across a niche range of the most popular door thresholds. Made in solid brass and the ultimate in quality. Popular products include the Feline 1 for joining carpet to hard floorcoverings and Feline 2 which joins carpet to another carpet. The Felines feature a gripper base strip which keeps the carpet under tension. A range of quality, sturdy trims made in high quality, aluminium. A fashionable stainless option is the latest, new finish available in this value range. Which floor edging do I need? 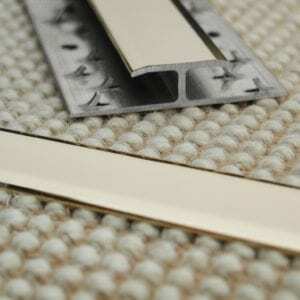 Carpet to carpet door bars e.g. Premier Double Z, Feline 2 or AL/92. Carpet to tile which you would use when joining a carpet to a ceramic, tiled floor. Again, we suggest the Premier Z, Feline 1 or AL10 options. Carpet trim with a curved edge – ideal for joining a carpet to vinyl or floorboards. We recommend the Premier Single9, Feline BNF or AL/ANF. Ramps which are ideal for joining two floorcoverings which are at a different level to each other. We offer a wide range for joining hard floorcoverings and carpet to hard flooring. Double naplock (base, gripping section on either side) which holds the carpet under tension on both sides e.g. Premier Double Z or Feline 2. 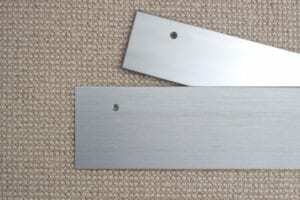 Z bar, which has a profile of a ‘Z’ and is used to join a carpet to a hard floor e.g. Premier Door Bar Z, or AL10. Q: I want all my floor trims and door thresholds to have the same finish throughout the house. We suggest you look at our Premier collection of floor trim and thresholds. The range is comprehensive and includes popular Z bars, naplocks, door thresholds along with specialist designs such as Ramps and floor edges. Q: When a floor trim is described as ‘universal’ what does it mean? We try and help our customers understand which product to purchase, by giving a brief description alongside the name. So, a Premier ZZ9: carpet to carpet is a door threshold which joins a carpet to a carpet. The term ‘universal’ means that the product can be used in most situations. The Posh: universal for instance is a cover plate which joins all types of flooring and caters for different heights of flooring. Q: We have brushed chrome door furniture – do you do brushed chrome floor trims? Yes, we do. Please see the Premier Collection, which is offered in both chrome and brushed chrome and the AL range e.g. AL92, AL10 which are offered in a satin aluminium finish. Q: I’ve been left a wide gap between the bathroom floor and the landing by our tiler – what can you suggest? We sell extra wide carpet trim in certain ranges and recommend you take a look at the SSEP, Premier Cover Door Plate, Floating Euro. Q: We have underfloor heating – which carpet trim do you suggest? It depends where your underfloor heating is. Most installations will stop either side of a door, and you could therefore use screw in or stick-down options, but you would need to check. Regardless, most of the door thresholds which require fixing to the base floor can either be nailed or screwed in place or stuck down with industrial strength adhesive, as used by fitters e.g. Premier ZZ9, Premier Z, Premier Single, AL92, and AL10 etc. Q: I’d prefer not to have to screw into our hard floor – what can you suggest? We offer a number of floor trim, which attach to the surface of your flooring only and are supplied with a peel off, adhesive strip on the underside. You simply need to cut them to length with a sharp hack-saw. Popular products in this range include the Premier Euro, Floating Euro, Compression Ramp, Lips and Ramps. For more detailed carpet trim product information, please select the relevant products in our shopping area and read the product specification pages.